What type of “ancient guidance” does the I Ching provide? 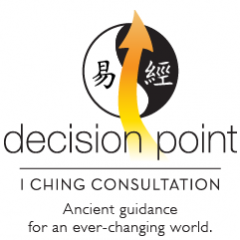 Why use Decision Point I Ching Consultation? At least 3,000 years old, the I Ching, or “Book of Changes,” is the oldest surviving system of divination on earth. By 1000 BCE, philosophers and kings living in the Chou province had developed the I Ching into the text-based system we know today. Indeed, this oracle was already fully formed and in widespread use in China by the time Confucius came to prominence around 500 BCE. He was so impressed with the oracle, and how it helped querents access the “way of Heaven,” that he designated this book as one of the six* Confucian Classics, official books of the Chinese educational system. Later, scholars inspired by his teachings, contributed commentaries (“The Ten Wings”) to the I Ching canon, which provided the oracle with a more explicitly stated spiritual and philosophical framework. Beginning with “the Creative,” the I Ching is comprised of 64 graphic images (“gua” or “hexagrams”) that are accompanied by text describing archetypal situations and images occurring in nature and human life. As the name suggests, the hexagrams are comprised of six lines that can be occupied by yang (i.e. “creative,” “light,” or “firm”) or yin (i.e. “receptive,” “dark,” or “yielding”) energy. The hexagrams can be studied together as a system of foundational Chinese philosophy that inspired both the Confucian and Taoist schools, or separately as an aid to decision making in response to specific, sincere questions. When used the latter way, the pertinent hexagram is derived via a prescribed, random procedure, such as tossing coins or separating sticks. These days, computer apps can also generate the hexagrams, though users of this quick method may not enter the reflective state that generally yields the most meaningful readings. Depending on the outcome of the procedure, the questioner often receives up to six additional pieces of advice (if any or all of the above-mentioned six lines are activated) as well as another “destination” hexagram. Because they provide additional detail that can clarify, expand, or even contradict the meaning of the initial hexagram, these “changing lines” often provide the core message of an I Ching reading. Thus the 64 hexagrams and accompanying 386** change lines can yield thousands of unique responses. These responses, some Chinese scholars say, represent every situation humans can encounter. *Five Confucian Classics survived; the Book of Music was lost. **The first two hexagrams each have an additional change line that can be obtained under special circumstances. You probably don’t need “ancient guidance,” but rather help with a decision, situation, or relationship that you are facing today. So, what I really mean by “ancient guidance” is “guidance inspired by an ancient, proven system.” When approached with respect and a sincere question, the I Ching can impart remarkable wisdom regarding a concern or question you are facing that is individualized to your personality, goals, specific circumstances, and overall life path. Typical advice you might receive includes the suitability and/or ethics of your intended action — and/or the probability that it can and will occur as planned. You can also ask the I Ching to comment on an array of choices in separate readings. But there’s more. An I Ching reading also reflects the spirit and character of the time when you are asking the question. Accordingly, it can give you advice about right timing. Many responses, in fact, address timing directly. For instance, if you obtain a non-advantageous reading for embarking on a bold new venture, the I Ching might be telling you that this is simply not the right time to do it. Maybe you’re not ready, maybe external conditions are not yet aligned to support your move, maybe others would interfere with your plans, or maybe forces that are not yet apparent will not support this action at this time. In such cases, you may be advised to wait a period of time, such as three months, and then ask again. Thus, while consulting the I Ching certainly is not a substitute for the love, passion, research, intuition, accumulated knowledge and skill, and hard work that are essential to the successful execution of your personal and professional goals, it can provide that extra insight to guide your actions. Such insight can be especially valuable when the decision is a momentous one that could change the course of your life, career, or business; entails a fair amount of risk; or is accompanied by an obscuring cloud of pros and cons. The I Ching really can be the proverbial “crystal ball” you always wished you had, providing you a privileged glimpse into the near-term future! The I Ching can also supply invaluable feedback on activities in progress, including their status, potential roadblocks to avoid or address, proper approach and attitude toward these activities, and the prognosis for success. And, yes, the oracle whose guidance used to send Chinese armies to war in 1000 BCE can also provide you with advice on that most personal realm of human affairs, romantic interests, as well as family, friend, and professional relationships. You can consult the I Ching about your prospects for getting to know a person you spied from across the room (and whether getting to know that person is really a good idea), how to address problems in your 30-year marriage, or any other type of relationship concern. For example, I’ll never forget how I obtained the hexagram for Conflict when I asked the I Ching whether I should hire someone for my small business. This particular hexagram warns that one should not engage in the activity under question because, in the words of Hellmut Wilhelm, the resulting situation would be a “hopeless struggle from which neither party can emerge victorious”** But because I had supervised her successfully for over a year at another company, I hired this person despite this clear warning. Failing to take the I Ching’s advice in this instance dogged me for years because it, unfortunately, predicted with precision that this relationship would deteriorate over time. **Wilhelm, H. (1977). Heaven, Earth, and Man in the Book of Changes. Seattle: University of Washington Press. You can certainly consult the I Ching on your own. There are many websites that contain hexagram generators and descriptions, or you can pick up any number of I Ching books and follow their instructions for doing a reading and looking up the answer. Further, the quality of translations varies tremendously — both in their clarity and fidelity to their ancient source. Depending on the source you’re consulting, the names — and sometimes even the descriptions — of the hexagrams will be different! And, even if you read Chinese, you will still need to study the text carefully and consult a teacher or other learned sources because it’s written in ancient characters that sometimes contain other meanings from the one(s) in use today. Further, the ancient text had no punctuation! Because the original text of the I Ching differs in these ways from modern written Chinese, it is open to many interpretations. Also, each hexagram has multiple levels of meaning, so it can be difficult to determine which most applies to your question. For example, each hexagram embodies a central image of a natural or human-made object (such as a lake or cauldron) or situation (such as peace or revolution). But its ancient ideograms also contain images and related meanings that may enhance or confound this image. Also, each hexagram is comprised of two trigrams that represent one of eight elements: Heaven, Earth, Thunder, Water, Mountain, Wind or Wood, Fire, and Lake. However, these same trigrams also represent family roles (Father, Mother, Eldest Son, Middle Son, Youngest Son, Eldest Daughter, Middle Daughter, and Youngest Daughter) as well as directions, seasons of the year, colors, parts of the body, etc. So, while additional meaning can sometimes be derived by looking at the interplay between these elements or relationships, it really takes experience to know which symbol(s) apply to any given reading. Then, even in cases where the text seems clear, you might find direct contradictions. For example, both hexagrams you receive may seem favorable, but the lines connecting them are not favorable. Or one line will literally contradict the next. Or the first hexagram and lines will be favorable, while the destination hexagram is not favorable. When consulting the I Ching about a new relationship, I literally once received a line advising me to not be too confident about this person, while the next told me to not be too skeptical! As it turned out, this paradoxical advice actually fit the situation: while this person did prove flighty and unreliable in the day-to-day, he was nevertheless interested in starting and sustaining a relationship (albeit on his own terms) with me. Finally, sometimes it’s not clear who or what the reading is referring to. Because a reading will not always delineate subject-object, the questioner might (justifiably) wonder whether (for example) an impending storm will swamp them or their neighbor. It could also be answering a more fundamental question lying behind the question that was posed. Or it could be commenting on the questioner’s dubious motivations for conducting the reading, such as to test or cajole the I Ching, gain an unfair advantage in a bet, or learn how to most effectively harm somebody. The more you work with the I Ching, the more you’ll gain the sense that it truly is guided by a wise, ethics-based intelligence! When you choose Decision Point to help you on your journey with the I Ching, you are tapping into my 35-plus years of experience working with this ancient system in myriad contexts. I truly can be your guide not only in interpreting the unique guidance you are receiving from the I Ching, but also in determining appropriate areas of inquiry and clarifying/crafting your questions. Finally, I can provide you with private instruction on how the I Ching works, and how to develop your own relationship with this wise oracle. See the Services and About pages for more details about my services and background. *The I Ching, or Book of Changes. (1950/1967). (R. Wilhelm & C.F. Baynes, trans.). Princeton, NJ: Princeton University Press.